The reversible PERLA cardigan has been receiving a lot of attention lately, proving to be everyone’s favorite cardigan. It was featured in Elle Magazine’s Trend Reports: Layering Pieces. The extra pop of color on the inside as well as the design adds dimension to your look. It’s a great layering piece that will pair well with anything else you are wearing. The classic silhouette and duo-color of this cardigan lends itself to limitless possibilities. Travel/Lifestyle Blogger Dr. Cacinda Maloney of ‘Points and Travel’ recently featured our reversible cardigan, Perla in her “Chic and ‘Value Luxury’ Travel Clothing: Jia Collection, New York” blog post. We are happy to hear that she was thrilled about the quality and design of our cardigan. Dr. Cacinda Maloney is a value luxury traveler who has traveled every six weeks of her life for the last 19 years, amazing! She has had an immense amount of experience with travel-related clothing in the past. When it comes to clothing for travel, Dr. Maloney looks for clothing that are made from quality fabrics, are comfortable, easily washable, and travel well. Our clothing is specifically designed for this type of woman who is constantly on the go, traveling for business or leisure, a jet setter, or a stay at home mom juggling various tasks. When it comes to design, we use fabrics that contain natural fibers, which includes cotton, linen, and silk. These are great fabrics that are breathable and keep you comfortable. Reversible 2-colorway in one jacket with draped front. Dr. Maloney also mentioned our “inside/outside” concept. The best part about our clothing is that it can quickly transform from a day look to a night look. Our reversible concept is essential for women on the go. It makes packing for trips much easier without headaches and saves time and energy. Why stress over what to pack and worry about the weight of your luggage? Most importantly, Dr. Maloney pointed out that she needs clothes that are age appropriate. She says, “At my age, it is important to maintain coverage in the clothes that I wear”. Our collections cater to sophisticated and stylish modern women who want beautiful and memorable clothing that are in tune with their lifestyle. We are very pleased that Dr. Maloney had an amazing experience and is a fan of our Perla cardigan. 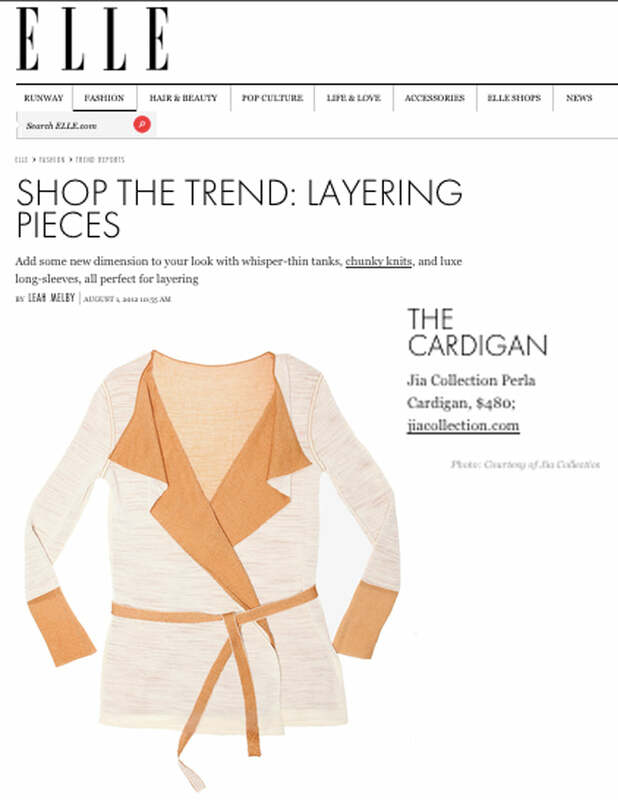 For more information about the Perla cardigan, visit our website at: http://jiacollection.com/products/perla.